my gf is getting me a new knife for my bday plus all the other things she has gotten for me. so i have been looking around for a new knife to replace my kershaw that i broke the tip off of. i am really liking the look of the edura from spyderco. i dont want to have her spend over 80-100 for the knife. does anyone have any experience with this knife? and if you had to buy one in my price range, what would you buy? im looking for a decent size blade, 3.5-4.25" and im looking for a solid color, preferably silver or a shiny black. I like the benchmade mini griptillian. I had a spyderco endura for about three years in the navy. It took a good bit of abuse but ended with the same fate as your Kershaw. i got the knife in the mail last night. i like it a lot, its pretty heavy which i like and seems very sturdy. i give a big thumbsup to thebladeshop.com :thumb: ordered it thursday night and monday it was in the mailbox. Thats crazy, they have a lifetime warr. but it doesn't cover the part that breaks off most knives? hmmm....interesting. i might have to try that out! with that type of price, I'd rather get a spyderco police. different strokes for different folks though. I have one of these. Much bigger than it looks. Not good for around the house use, but for self defense it is awesome. For work I use a Gerber EZ open. I could flick this open one handed while blindfolded no problem. Still not a great screwdriver, but its sturdy enough for any cutting jobs I have come across. I have a SOG Trident. Pretty sweet assisted opener. The coil spring broke though, so it is time to see if SOG will step up to their lifetime warranty. 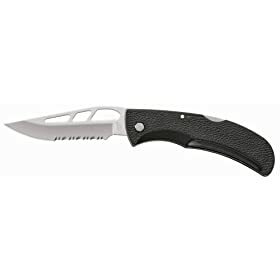 So what website has great deals on knives? I usually see that online retailers are more expensive, than folks at gunshows. 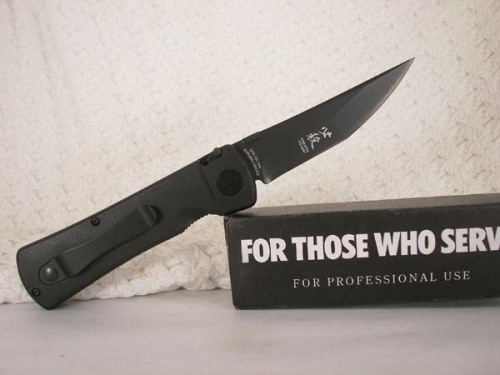 Typically most knife companies will repair a knife for cheaper than purchasing it new. If it is a good knife, send it in with a letter saying how good it served you over time. A little flattery never hurts. I have had Buck's and several watches totally reconditioned to like new condition for less than thirty bucks. bobapunk wrote: I have a SOG Trident. Pretty sweet assisted opener. The coil spring broke though, so it is time to see if SOG will step up to their lifetime warranty. http://www.microholics.org" onclick="window.open(this.href);return false;. It takes a couple days to get signed up, but it is well worth it. It is just a good group of knife lovers and dealers selling, buying, and trading knives. Lots of Microtech's, MOD, Strider, Spyderco, etc. You name it and it will be on there or put it in a "Want" ad and someone will find it for you. http://www.bladehq.com" onclick="window.open(this.href);return false; is a good place to get good pics on knives. They have a HUGE inventory, but some are a little too pricey like the MT's. A combat knife needs to be double-edged for 80% of the blade width. I rarely find this feature except from custom knife makers, even with all the black tacticool spec-op looking knives out there. The endura is a good knife. Spyderco uses hard steel which you can get very sharp, but at the same time, the tip will break. When you do break it send it to them dont try to fix it. I would get a small multi-tool if you are a repeat offender with breaking the tips. enjoy. Spyderco makes some great knives. I've got a few Police models and carry one during my work week. Never had any issues with any of them. The VG-10 steel you mentioned is very nice. Should hold a decent edge for quite awhile.